CRISPR is revolutionizing the field of gene editing. It has the potential to alter the course of research and drug discovery, by providing scientists with a powerful tool to change any gene, in any cell in a highly targeted manner and without introducing foreign DNA. 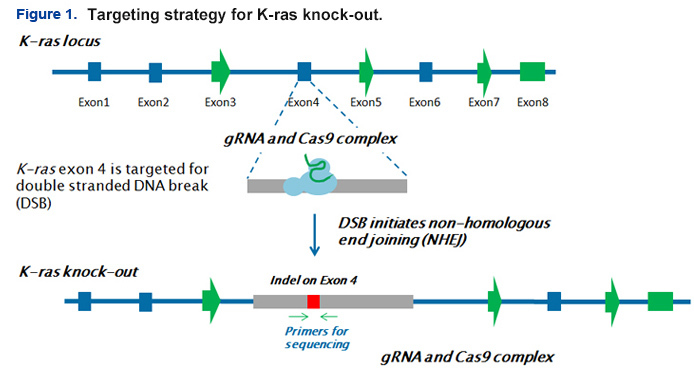 The benefits of CRISPR/Cas9 over previous forms of gene editing, such as TALENs and zinc finger nuclease (ZFN), are that it is much simpler to implement and has higher efficiency at performing bi-allelic gene modifications. GenScript is pleased to introduce GenCRISPR™, a full CRISPR-based gene editing service, to produce a genetically modified cell using any mammalian cell line and targeting any gene. Our scientists are experts at performing gene editing with CRISPR, from designing gRNA constructs for CRISPR to transfection and single clone generation of a wide range of cells, including difficult-to-transfect and tumor cell lines. Customer specifies gene/locus region and cell line of interest* Available for 120+ popular transfection-suitable cell lines, including A549, CHO-K1, HEK293, HEK293T, HT-29, MDA-MB-231, 4T1, A20, HCT116, HepG2, Jurkat, MCF7, MDCK, PANC-1, U937, RPMI 8226, etc. * It is preferred that customers provide their own cell lines, despite available cell lines can be purchased by GenScript for an additional fee. Please note that we currently do not provide genome editing service for primary cells, stem cells or iPS cells. ** Validation services for knock-out cell lines can be found under the "Add On Services" tab. Reverse transcription (RT)-PCR Validate the knockout clones to carry the INDELs on CDS at mRNA level by sequencing the RT-PCR product. Western blot Validate the knockout clones by western blot. A validated antibody in the host cells with specific binding to target protein (RNAi or knockout) must be provided. FACS analysis Validate the knockout clones by FACS analysis. A validated antibody in the host cells with specific binding to target protein (RNAi or knockout) must be provided. Promoter activity survey Survey the promoter activity (Cbh/CMV/EFS) in the host cells to maximize gRNA-Cas9 cleavage efficiency. Transfection optimization Survey the transfection methods for the hard-to-transfect cells to maximize gRNA-Cas9 cleavage efficiency. Off-target analysis Characterize one knockout clone by sequencing the top 10 of potential off-target sites. One additional clone Sequence additional single clones to identify one additional knockout clone. QC and deliver one additional knockout clone. CRISPR gRNA constructs: all-in-one and dual WT SpCas9, SaCas9 and Nickase plasmids for single gRNA expression. SAM constructs for transcription activation. CRISPR gRNA libraries: genome-wide knock-out ( GeCKO v2), transcription activation ( SAM) and pathway-focused libraries for efficient screening. GenScript offers lentiviral based service, CellPower™ and other cell line services. gRNA pairs are designed to target the flanking locus of a full gene to delete a full gene on genome. gRNAs pairs are optimized with highest cleavage efficiency in the Jurkat cells by GenCRISPR technology (Figure A). The paired gRNAs are co-transfected to the Jurkat cells and enriched by FACS sorting. 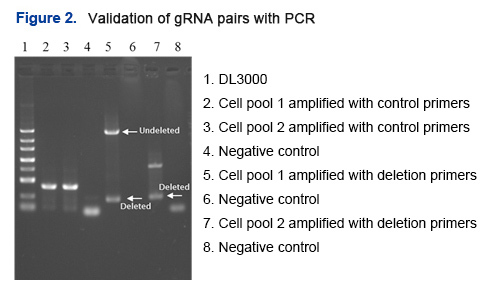 The deletion efficiency is evaluated by PCR. It is 21% in the transfected cell pool as calculated from light intensity of band (Figure B). 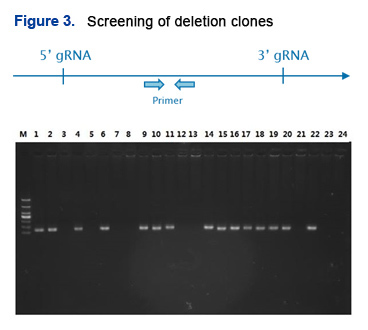 200 single clones are screened with PCR in a high-throughput way and a few of full-allele deletion clones are identified and confirmed by Sanger sequencing and RT-PCR (Figure C). Email the form to bioprocess@genscript.com or upload the completed form through our secure online request management server. Orders can be placed by phone, email or fax with a formal PO (Purchase Order) or credit card. Our customer service representatives are available 24 hours a day, Monday through Friday, to assist you. However, you may also contact us by email, phone, or fax.